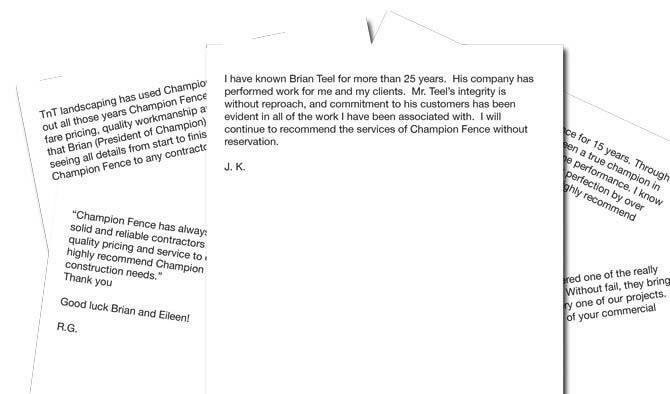 "I will continue to recommend the services of Champion Fence without reservation." "Through out all those years Champion Fence has been a true champion in fare pricing, quality workmanship and on time performance." "Without fail, they bring quality pricing and service to each and every one of our projects. Champion Fence strives for perfection with our workmanship and our products. Our field employees and foremen are experienced and highly professional. Some employees have been with Champion Fence for over 17 years. Our 4 1/2 acre yard gives us the ability to keep inventory on hand in order to meet the needs of our constituents and it enables us to provide fast and reliable service. Founder of Champion Fence in 1996, Brian brings over 20 years of experience in the fencing industry. A graduate from Colorado State University in Ft. Collins, Brian received a BS in Industrial Construction Management in 1982. With the support of his 3 children and wife, Brian built Champion Fence from the ground up. He applauds the Denver contractors that played a role in the success of Champion Fence and looks forward to the company’s future endeavors.